I wanted to create some nail art the yesterday. But my wanting to watch The Avengers in 3D took the best of me. Yes, I am a Marvel fanatic. Anyway, that meant that I got to wore a lovely nail polish by itself until this morning when I decided to do some nail designing. The idea was quite simple but painting it deemed relatively difficult, especially for my non-dominant hand. 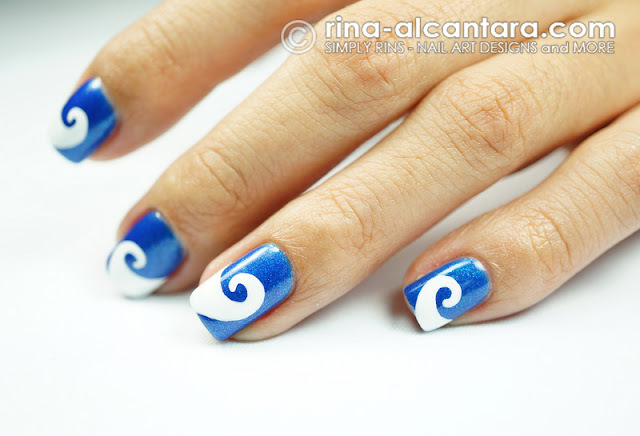 I named this nail art, Wave-y. The polish reminded me of the water so I wanted to do a design with that in mind. Hence, I painted waves. It's summer here in the Philippines and most of us have gone to or have plans to go to the beach. Well, I haven't and have no plans either. I'm not particularly fond of beaches simply because I don't know how to swim. But I have tried surfing a couple of times because I was assured that swimming is not a requirement. I enjoyed my sessions riding the beginner's waves but I still have not soften up to the idea of hanging out in beaches. The only thing I enjoy in the beach is finding a good spot to relax and enjoy the sight of the sea. Do you find that weird? This is 2 coats of A England Order of the Garter. Application was a breeze. Formula can get thick after a few dips or perhaps it was just with the bottle that I got. 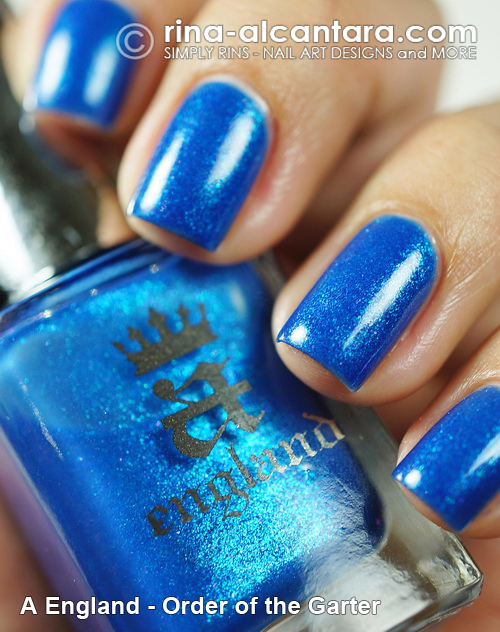 It is a shimmered royal blue polish and I love it. I only wish it had a really shiny finish. I used only white acrylic paint and a detailing nail art brush to hand paint the design. Like I said, I idea for the design was simple but I personally had a relatively harder time with the strokes. I personally find curve lines a challenge when it comes to nail art painting. I guess it's because of the amount of precision required. 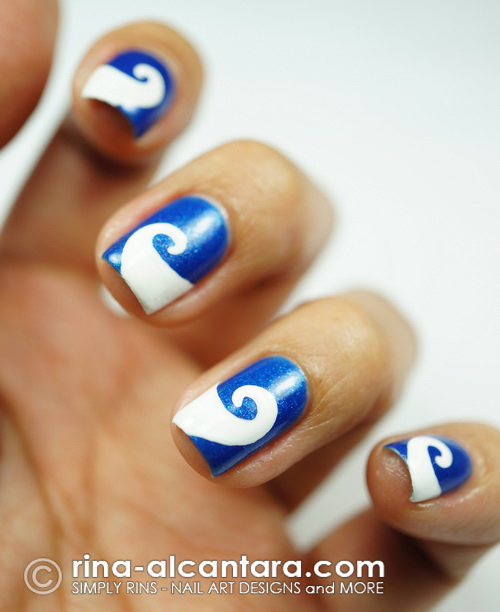 I remember when I did my Swirls Nail Art, it took me a longer time than usual to finish the design. The experience was similar to when I was painting these waves. After I finished with a few nails, I realized that it was easier to control the strokes if I water down the acrylic paint. The problem with this is that the opacity is sacrificed. That meant that I needed to add another layer to make the white color reach the opacity that I wanted. But I figured adding another layer of paint was easy once the shape of wave is established. If you are going to try this design and should you find yourself in the same disposition, you may want to try this tip of watering down the paint a little. 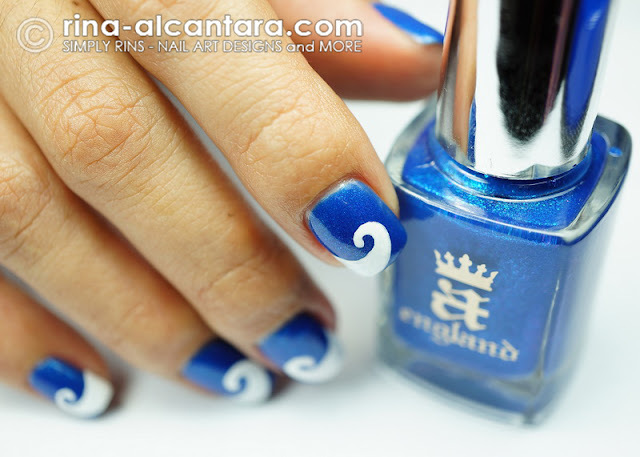 I also see this nail art design as a twist to the french tip manicure. I think this would make it look more interesting ... and unique. P.S. I'm sorry if I keep changing how I watermark my photos. I'm still tweaking on what would appeal to me. I know now that I'm being fickle-minded about it. This is so summery! I love it! It makes me want to lay on a warm beach. Simple but so effective! And a-england Order Of The Garter is beautiful! So very nicely done! I like the clean and graphic look of this design. Very nice, you really inspire me! I am new to your site, but was hoping you could do a post with your natural nails, and your nail care routine?